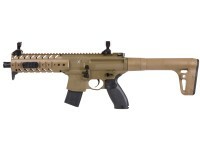 Decimate soda cans and shred paper targets with the SIG Sauer MPX! 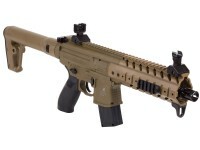 Based on the gas-operated submachine gun of the same name, this MPX runs on 88 or 90-gram CO2 cartridges to send shots downrange at speeds up to 575 fps. Each MPX includes a 30rd rotary-belt pellet magazine and a rifled barrel to increase the accuracy in fast-paced tactical shooting sessions. Packed with realistic controls and specs, the MPX exudes all things tactical with its all-metal action, durable polymer stock and forend, and a long Weaver Picatinny rail. The included adjustable flip-up sights are removable, and the rifle really begs for a dot-sight for even faster target acquisition. 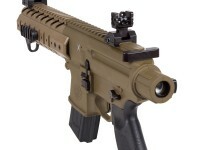 A tri-rail surrounds the barrel, and features a lower rail, and 2 side rails with small Weaver mounts for attaching accessories like flashlights and lasers. 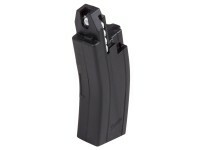 Each includes sling mounts for easy carrying to and from the range (sling not included). 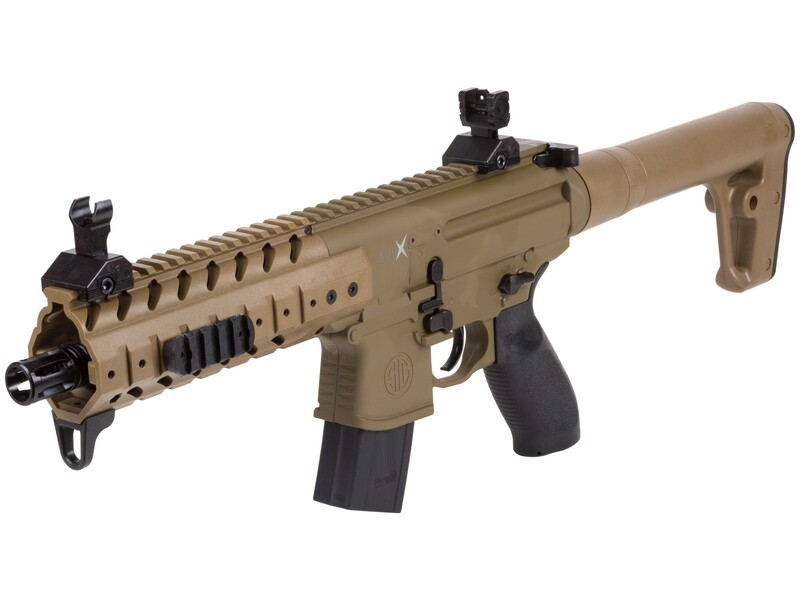 If you want a one-of-a-kind fast-paced shooting experience that only SIG Sauer can provide, the MPX is sure to give fans of target shredding hours of backyard shooting fun for years to come. Things I liked: The weight feels good. Plenty of metal. It is heavy but not overbearing. 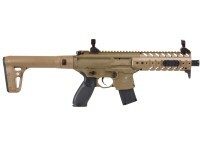 It comes in FDE or Black. Magazines are easy to load. Belts are easy to load into the magazine. What others should know: Good value for you money. Things I liked: Replicating Sig's 9mm MPX is spot on for appearance and weight. Accuracy is superior to any of my pumpers. Absolutely love the 30 round mag. Put a red dot and angled fore grip on it. Long time keeper this one. Things I would have changed: Can't think of a thing I would change at this point. 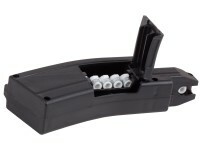 What others should know: Careful inserting the mag after loading. Mine got hung twice. I make sure it slides along rear of magwell and give a firm push in. How is the trigger pull? Heavy/light, long/short, crisp/creepy, single/dual stage? How closely are the colors matched? It appears from the photographs that the receiver is FDE, but the handguard and stock are slightly different. What ever happened to this AirGun being offered in .22 caliber? ?